Dimensions 11.50" x 4.00" x 2.00"
This keyboard is amazing its so small and compact the quality is insane i know it cost a pretty penny 140$ but man i don't regret it. The cherry mx silent reds are perfect for recording or streaming for crisp audio. But i do wish it came with a keycap puller. Got Cherry MX red switches (silent). The keyboard itself, for the most part, is silent, except for the rattling on the SPACE BAR, BOTH SHIFT KEYS, ENTER, And BACKSPACE. I don't want to go through the trouble of lubing the stabilizers when they should already be lubed, or come with better stabilizers. If you don't mind the sound of the spacebar and other long keys rattling, go ahead and buy the board. But with the quality of the stabilizers, the price really shouldn't be $130 . I would return this, but I already had to deal with returning another keyboard that came defective, and I do not have the patience to return this board, buy another one, and hope that will not disappoint me by having crappy stabilizers or something. Without the stabilizers taken into consideration, the board would be a solid 5/5. But because vortex likes to use cheap disgusting stabilizers along with nasty ABS keys, the board itself will receive a 2 star from me. What in the world makes them think that these stabilizers would satisfy anybody? Just like the previous reviewer, this keyboard came with stabilizers that don't properly fit in the plate resulting in squeaks and rattles. Very disappointing as I expected much better I would return it but I've already returned 1 keyboard to MK in the last week since they sent me the wrong form factor. I will try different keycaps and probably end up lubing the stabilizers. The stabilizers on my pok3r make a very bad squeaky, rattly noise that ruins the entire keyboard for me, making it feel cheap and not worth the $140 I paid. Removing the spacebar, shift, backspace and enter keycaps I notice the stabilizers are very wobbly. 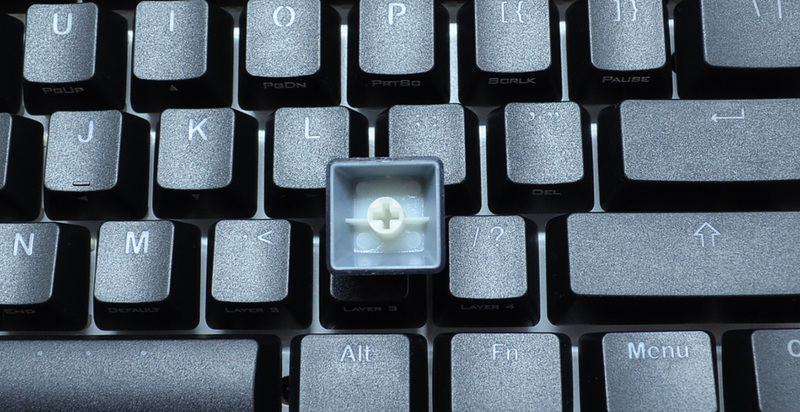 Reseating the keycap does not do anything to fix the terrible squeak and rattle. I don't know if I'm just unlucky and received a "bad" keyboard. I'm usually very lucky that products work well for me, but not this time. I don't want to go through desoldering or trying to fix it on my own, as I believe it should've worked properly out of the box. I like the size and the hefty base, the body of the keyboard is simple and elegant, and all other keys feel nice to type on, however the longer keys with stabilizers are so bad I will try to get a replacement. The inconsistent feel of these keys ruin the experience for me. If it happens again I will return it and look at another brand. Without considering the stabs this keyboard is a 5/5, but with the stabs I can't even give it a 1/5. Fantastic vendor. Fantastic customer service. I would reccomend MK.com to anyone. 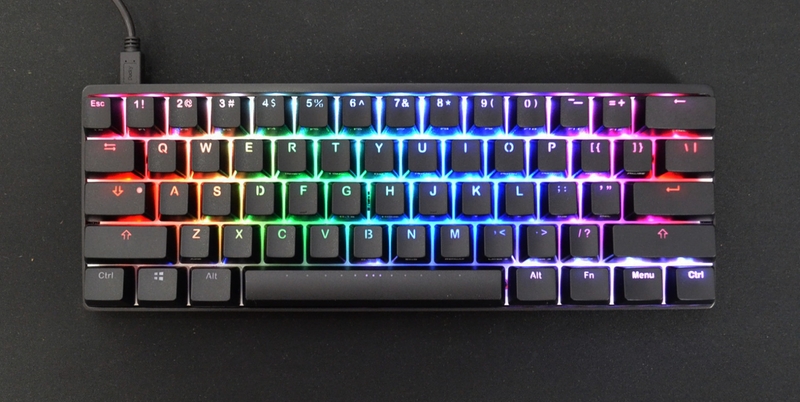 This keyboard is a little bit different than a corsair or razer type keyboard in how you program the RGB. Everything is done on the keyboard itself and not on some program. To be 100% honest, I like it a lot better this way. Build quality is wonderful. I would go 7/5 if I could. As my first programmable keyboard, I'm super impressed with this keyboard. The biggest wow factor is that I can use it in the office and we work in an open space, so that says a lot about how quiet they are! And to be honest, I was also surprised at how the pre-programmed keys already meet a lot of my requirements that I wanted in a programmable keyboard, so kudos again on that! Highly recommended if you're thinking about getting one! This keyboard is soooooo quiet, I love it! Brought it to work and didn't bother anybody and the color cycles of the pok3r series is nice as well. There is a slight squeak to the space bar. 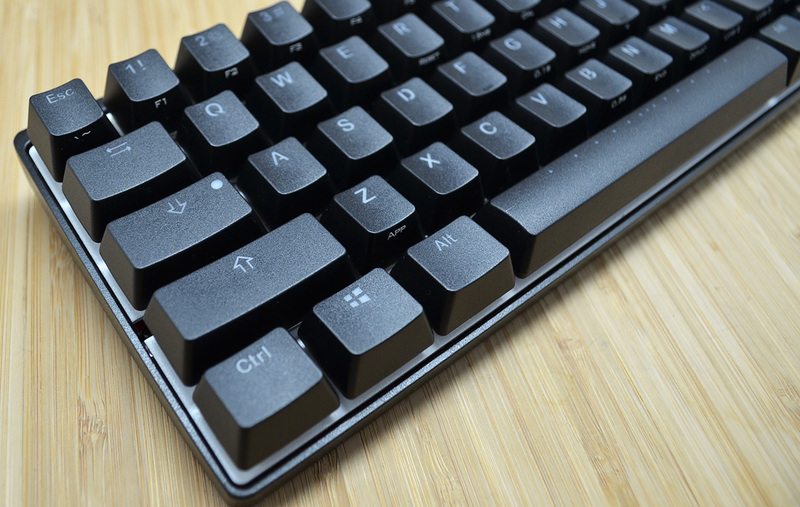 The Vortex Pok3r is simply the best introductory mechanical keyboard for those looking to upgrade from their laptop's keyboard or another non-mechanical board. The Cherry MX brown switches are a dream to type on, with the lightness of the blues without their noisiness. I chose the browns over the blues because I have a roommate at university and I'm glad I did; my roommate had no problems with the browns and I found myself tied to the browns over the blues after typing on this board for a week. The Pok3r is very well constructed. Nothing is loose, wobbly, or creaky. The case is a heavy anodized aluminum which keeps the board fixed. The RGB backlighting looks very good with minimal light leakage. The configuration for custom profiles and different lighting effects is simple and straightforward having read the likewise straightforward manual. A complaint for some but ideal for me, my board has a black frame with black switches but a white PCB; perhaps this was done to improve lighting. I changed my modifier caps to white, as I intended when I purchased the board. The combination of white modifiers and a white PCB completes my ideal board setup. 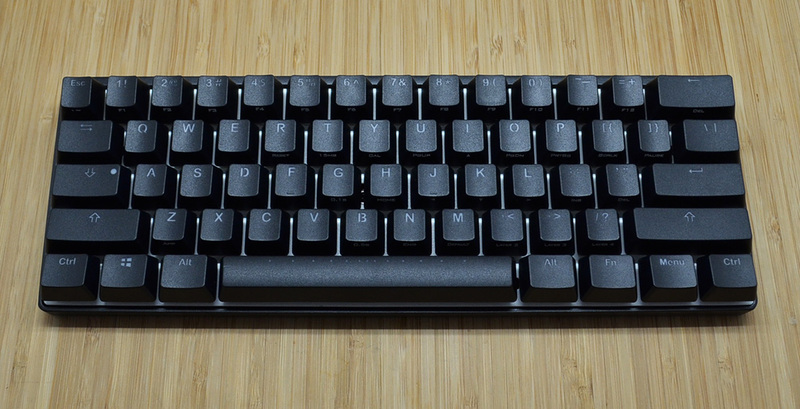 I HIGHLY recommend this board for anyone looking to get their first mechanical keyboard, especially because the 60% layout is compact, clean, and teaches the importance of function layers (at least it did for me). 10/10 Vortex. I'll be buying more soon. Over all this is a great keyboard but I would not recommend getting this until Vortex can follow up on their preorder dates. I ordered this keyboard on February 26th and barley revived it on May 15th. This should not be acceptable for a popular company with high prestige. Overall i would recommend waiting for it to be actually in stock or not get this at all until Vortex can fix this issue. 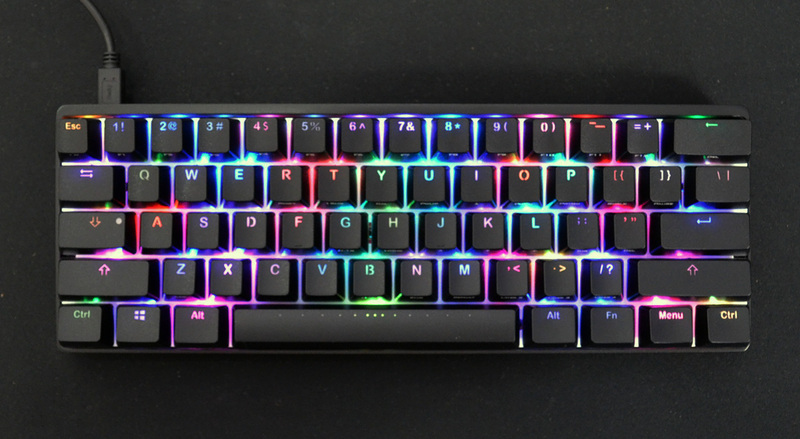 Also shipment was a nightmare as it took forever, along with the preorder delays i asked for faster shipping for compensation and they rejected my request, which i needed as my keyboard was breaking down(cheap rubber dome) So I will still say that this is the greatest keyboard that I have used. But will not recommend getting a preorder until they can keep their promise on the preorder dates from this company and at the very least invest in faster shipping. This board is just stellar. It has a heft and quality to it that makes it really feel worthy of its cost. The browns sound and feel incredible - while I don't own browns on any other board, I hear they sound best in an aluminum case, and they sound pretty stinkin' tasty on this Pok3r if you ask me. The manual is a bit confusing at first - just skip it and go to YouTube to figure out how to do the lighting configurations. Colors pop against the white backplate, and once you get the hang of changing colors around it's super fun and easy. I don't have any use for the programming function of the board, so I just set all four layers to different color modes. There are a ton of color options, so you could easily keep your color layout fresh for years and years. The board is simply a delight to use. Highly recommended. So is toggling dipswitch 3 to make capslock another Function button. It makes using the arrows soooooo much easier. I also love that Delete is on both the backspace key AND the apostrophe/double quotes key. Means you can delete while never leaving home row. It's worth mentioning, too, that Fn A, Fn S, and Fn D can control volume and Fn Q, Fn W, and Fn E can control music playback. This works in Windows and macOS, and in any music player. I use it with Spotify and it's great. Someone coming to talk to me? Fn W and my music is paused instantly. This isn't really covered in a lot of reviews and these controls aren't printed on the front of the caps, so I wanted to mention them here. Also if you're a Mac user, Fn [ and Fn ] adjust screen brightness. I'm still finding little controls here and there, but I bet most Mac function row key controls are possible on this board. somewhere. I hope to find them all soon. Overall just an amazing keyboard. I preordered it two months before it came in stock, and it was so worth it. Love, love, love. Excellent keyboard with beautiful lighting. Could have been better if the keycaps were PBT. I absolutely love this keyboard. I bought it simply for the size alone. I play a lot of FPS games and I tend to make large sweeping mouse movements and with a fullsize board, I tend to hit it far too often. It's absolutely beautiful and feels amazing to type on. The layers are nice and fairly easy to use. The RGB lights are absolutely beautiful. My two gripes are that it didn't come with a manual or braided cable. Also, in the online manual, it shows an FN (function key) and a PN key. The PN key is the MENU key. There is nothing to indicate that MENU=PN. There should at least be something printed on the side of the MENU key indicating it as the PN key. I still give it a 5 star rating because once you figure out how to use it, it's an amazing keyboard. Fantastic build quality! Until now, I had never used brown switches nor 60% designs, and the Pok3r RGB has exceeded my expectations. But hey, pretty sure I'm preaching to the choir around here. Anyway, pre-ordered and delivered as promised, so Thank you MKeyboards!! I ordered my keyboard on 3/23/17. It came into stock on 4/6/17. It received it today on 4/13/17. I will echo this previous reviewers statement about the build quality. I'm coming from a 2013 razer blackwidow keyboard with green switches. This keyboard has a wonderful heft to it that I don't get with the razer plastic keyboard. The pok3r's aluminum case is compact and sturdy. The brown switches are absolutely amazing. I did a ton of research about which switch I would prefer, and I'm incredibly happy with the feel and acoustics of these switches. The RGB functionality of the keyboard is working flawlessly so far. This is really a wonderful product. This keyboard is pretty solid overall. My primary reason for buying it is so I could transport it around. I don't like using the mushy and oily school keyboards, and while I also have a Shine 5 and the Disco, those are rather difficult to carry around. The Poker fits in my backpack very well. The RGB LED's is also a plus if you are into backlighting, but you are also spending more money for the LED's. 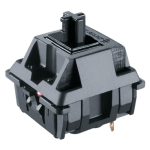 The Cherry Blue switches are as amazing as always. My primary complaint with the keyboard is the stock keycaps. They just didn't feel good to type on. Luckily, the Hana keycaps shipped from Massdrop sometime after I received the keyboard, so I only had to deal with the stock keycaps for about 2 weeks max. I like typing on the Ducky stock keycaps, but the ones on this Poker RGB don't feel that great. Otherwise, the keyboard doesn't come with a manual, so it oculd be difficult to set up the LED's. Just look for some Youtube videos or read about them on Reddit. I really like the Vortex mode. I received it today on August 18th. I was extremely happy with the shipping and customer service response. The Quality of the keyboard itself is fantastic and love all the functionality. Thanks for the excellent service MechanicalKeyboards.com! Pros: Default Keycaps are way better than stock Poker3 nonRGB keycaps. Metal case still the default. Seriously no manual in the box and no easy way to find it online. Soooooooooo nice. Feels like an upgrade from my Ducky Mini 2 for sure. Rainbows. Rainbows for days. Slomo vortex rainbow mode to be specific. Look, if you're going to go 60%, why not do it in style? Nature White is very pushy and my fingers glide across at 100WPM day 1. You've got to believe this keyboard is the answer to all the 60%ers out there who want RGB and high quality construction. I'm probably going to get the translucent key caps just to complete the minimalist look. It's just a rainbow all day and I love it. Great keyboard with solid build quality and key feeling. If you want to use 60% size keyboard with cherry and rgb, this is it. However, programming and setting rgb is bit complex since you need to look up manual online. Keyboard feels absolutely amazing, but the programming is not very good. For example basic functions do not work in the default layer. I would not recommend this keyboard if you want to use it in the default layer (other layers ruin your color preset).